This will be the second Summer in a row that we are not able to go on any type of vacation. Last July, Princess was born, so that ruled out any trips for that year, and now, we are working hard to save for a house, so we’ve chosen to stay home so that we can save more money. Even though we are staying home, I am itching to travel! That is why I came up with this fun date night idea! My husband was skeptical, but willing to give it a try because he knew I was excited about it. The first time we tried this date was over a year ago, and he still talks about it. We both loved our fake vacation, so I just had to share the idea with all of you! So how do you go on a fake vacation? It’s simple! Get together with your spouse and choose a part of the world that you’d like to visit together. Then use google images to find photos of what you would see if you took that trip. You search for fancy hotels to stay in, or scenic tours to take. Plan out the entire vacation as if you were actually going! The best part is, time and money are of no concern since it is not a real trip, so you can plot out the most extravagant trip possible! I love traveling but hubby hates riding in planes, so this is a fun way for us to “see the world” without wasting any money or having to endure long plane trips! For an example, I will share part of our trip with you. We chose to visit British Columbia, Canada. We enjoyed some camping in the mountains, and then took a guided bike tour through the city learning about all the history from the street level. Hubby also wanted to do some mountain biking (which I can’t actually do in real life) so we enjoyed some beautiful trails from our bikes as well. It’s amazing the things you can find to do online. We were picking out specific bike trails we wanted to go on and showing each other pictures from google images. Next, we decided to go Kayaking. I was thinking a small trip around a pretty lake would be nice, but hubby found a 15 day adventure kayaking on the central coast. It was an expensive trip, but seemed fun so we pretended to go on it too (since we have an unlimited amount of fake riches and our fake kayaking muscles are really strong!). The pictures we found from that trip were amazing, it was gorgeous, and would be a really cool thing to do in real life too! The great thing about “fake” vacationing is that we can easily agree on what to do. In real life I probably would not go on a 15 day kayaking journey, I can’t imagine that I physically could but we were able to “go for it” and have a ton of fun pretending! After our 2 weeks kayaking I decided we should spend some time resting and relaxing and found this BEAUTIFUL little cottage/Inn called Inn for two. Wow. Follow that link to see some AMAZING pictures of the inn and it’s surrounding areas. So romantic! I also found a restaurant called ‘red fish blue fish’ and decided we had to go there before we headed home in honor of Little Man (and his love of the book 1 fish 2 fish red fish blue fish). We had such a great night planning out our trip. Even after we were done planning our fake vacation we kept looking at different pictures of whales and animals that we would have seen on the vacation. We found some really neat stuff, and really enjoyed doing it together! It was simple, it was fun, and it was FREE! We were able to laugh together, talk and have fun without sneaking peeks at our watches or wondering how the kids were doing, home without us. This was the perfect addition to our home date night list, and we both had a lot of fun! So get to planning! 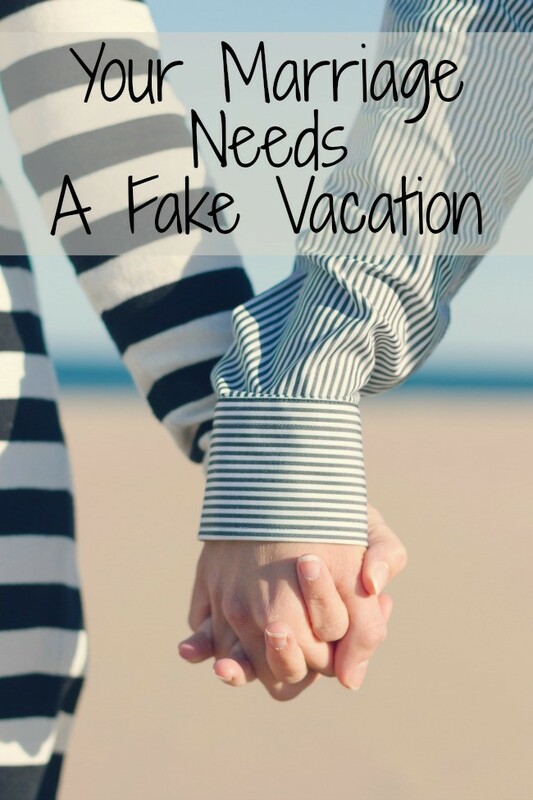 Where will you and your hubby go on your “fake” vacation? Want more encouraging marriage stories or advice? Check out our favorite marriage books here! Be sure to follow us on Instagram for more! Aww I love it!! So creative. What a wonderful idea! We’ll have to try it. Thanks for linking up with The Alabaster Jar! I hope you have fun! :) let me know where you go!!! It sounds like you two have a lot of fun together! I hope he’s willing to try! My hubby was skeptical but ended up having a lot of fun!!! Love it!! I’m from Victoria, BC originally. When my hubby and I were on our real vacation we found some inexpensive places to go. One evening we went on the Scotsdale Art Walk. All the local art galleries open their doors and you can walk in and check them out. It was fun. We got to giggle at the $4000 Green M&M and the $58,000 garden sculpture (I’m sure that wasn’t what it was intended for, but would look great on my lawn). Thanks for linking up this week. wow those sound AMAZING!!! I will have to tell hubby that we need to “go back” so we can visit there too!!! sounds incredible! so true! we had so much fun!!! Love it!! And I absolutely LOVE The Dating Divas. Just a few moments ago, I posted one of their ideas on Twitter that they added to our link up. I hadn’t come across this idea before so thanks for sharing. It is an awesome idea! Visiting from Happy Wives Club Link Up! Thought I’d seen this post before. Then I realized it was an old one :). Perfect! Fits right in our budget! Love the idea! It’s very creative! Greetings! Great post as always – really enjoy reading up on your parenting advice and tips. This fake vacation idea is super creative and sounds like a lot of fun! If in the future you decide to put one of your fake vacations to the test and travel with your husband, I suggest hiring a house sitter! They can pick up your mail, water your plants and even look after your pets. I recommend visiting a website like Housesitter.com to view opportunities for you! Hey Buddy!, I found this information for you: "At home date night – fake vacation". Here is the website link: https://www.beautythroughimperfection.com/at-home-date-night-fake-vacation/. Thank you.